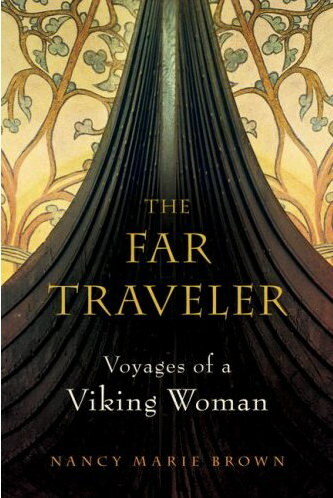 Nancy Marie Brown’s latest book, The Far Traveler: Voyages of a Viking Women, has earned great reviews and much interest. Now available in a paperback edition, it tells the story of the Norse exploration to the New World through Gudrid the Far-Traveler, an 11th century Icelandic explorer. We were able to ask the author, Nancy Marie Brown, a few questions about her book. 1. Your background is as a science writer (among your articles is “The Chemistry of Caterpillar Guts”). Could you tell us about your path that led you to writing about the Middle Ages? For the last 25 years I’ve led a double life. 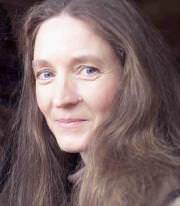 I was a first-year graduate student in Comparative Literature at the Pennsylvania State University, hoping to specialize in the medieval Icelandic sagas, when I was offered a job as a science writer for a magazine the university published. It paid enough to live on and, once I advanced to full-time, provided a three-quarter tuition break! I found I loved science writing and the enormous variety of things I could learn by interviewing scientists. I still loved the Icelandic sagas-but professorships in Old Norse were (and are) pretty hard to find, so I had no incentive to finish my doctorate. Instead, I spent my vacations in Iceland, hiking, riding horses, and studying the language and culture. I wrote about Iceland: short stories, children’s books, a historical novel (all unpublished), and a memoir, A Good Horse Has No Color: Searching Iceland for the Perfect Horse, which came out in 2001. In 2002 an anthropologist at Penn State, Paul Durrenberger, called to tell me about his latest research project, hoping I would choose it for an article in my magazine. “We discovered a Viking Age longhouse on the farm of Glaumbaer in northern Iceland,” he said. I replied: “Glaumbaer? You mean where Gudrid the Far-Traveler lived?” It was not the answer any other science writer would have given. I saw this research project as a way to combine science writing and Icelandic sagas. I contacted the scientist in charge, John Steinberg (now at the University of Massachusetts-Boston), and asked if I could volunteer at Glaumbaer-and write a book about it. He said sure, and went on to treat me just like one of his students, which meant long days on my knees with a trowel and and lots of heavy buckets of dirt. 2. I was wondering how the structure of this book came together – did you intend to write a book about Gudrid the Far Traveler from the very beginning, or did your research lead you towards developing that as your focus? I had planned to use the story of Gudrid and the dig at Glaumbaer to explain new scientific techniques, such as remote sensing, that are changing the way archaeology is done today. We had this conversation by phone when I was already in Iceland, volunteering on the archaeology crew, with a pretty firm outline for a book on modern scientific archaeology. “I said, Wow, you want me to write a book about the Vinland sagas?” It was not a hard decision for me to make-although I think some of the archaeologists were a little disappointed. 3. You write, “The sagas hold memories, archaeology can provide me with facts and physical objects.” Could you expand on how you dealt with piecing together both the written and archaeological sources for this book? Since so little is said directly about Gudrid’s daily life in the two Vinland sagas, I looked for information about the lives of women in Iceland and Greenland in general around the year 1000, and about women’s roles in exploring North America. Much of that information is provided by archaeologists studying ship building and navigation, material culture, farming practices, diet and nutrition, the design of homes and churches, and the technology of weaving. The most surprising thing archaeology taught me that the sagas did not was the economic importance of women in the society. I spent a day with two experimental archaeologists at the Center for Textile Research, University of Copenhagen, who were reconstructing Viking Age weaving techniques, testing such things as the effect of the size and weight of a spindle whorl on the quality of the cloth, or on the time it took to weave different patterns and textures. From them, I learned that one sail for a Viking ship needed a million feet of thread-the wool of 200 sheep-and took two women four and a half years to make. For me, that puts the entire Viking Age into a different context. Only women did the weaving. If a Viking explorer was not backed up by his women, he didn’t sail. 4. The book has now come out in a paperback version, which gives it an added appeal as a textbook in university and college classrooms. How do you think your book can be used in a teaching environment? The Far Traveler opens a doorway into the world of the Icelandic sagas, answering questions that are raised by the original texts-especially about the lives of women. It’s the companion guide I wish I had had as a student of medieval literature. By combining history, science, and travel memoir, I tried to take my readers with me as I sailed in replica Viking ships and toured the Viking areas of Scotland, Iceland, Greenland, and Newfoundland. I interviewed dozens of archaeologists, historians, and literary scholars, and put the most recent (and often unpublished) scientific information and literary studies into the context of Gudrid’s story. Because of its feminist point-of-view, The Far Traveler would be useful in any general medieval history or medieval studies class. Gudrid and her peers are women of a very different sort than the medieval women to whom I was introduced as a student-those objects of courtly love so concerned about their virginity. Viking culture, I’ve learned, didn’t classify people as feminine or masculine. They were either strong or weak, winners or losers-or somewhere in between. Women in the Icelandic sagas were praised for being brave, quick-thinking, and tough, just like the men. I think it’s important for modern women to meet medieval women like Gudrid. 5. You just had the opportunity to speak with students at Dartmouth University who have been using your book in their class. What was the kind of feedback and questions you received from them? This was a first-year writing-intensive seminar for students from all different majors-economics, biology, business, computer science. There wasn’t a single literature major. They asked if the people of modern-day Iceland were still influenced by the sagas, were the sagas history or fiction, what was their connection with Tolkien’s The Lord of the Rings, was Gudrid typical of her times, and was she my favorite woman in the sagas? They wanted to hear how the Icelandic language sounded. They quizzed me on my habits as a writer-how I defined “science writing,” how much time I spent researching vs. writing, and whether I thought content or style was more important. They asked me to read a passage I was proud of. In return, they sent me some of the papers they wrote. My favorite came from a young woman who said Gudrid was “a modern woman” who could teach her “the art of traveling.” Gudrid had “an international mindset” (the saga says she could “get along with unfamiliar people”) that would fit right in with today’s focus on globalization. She concluded by saying that Gudrid was well worth knowing as “a contemporary role model.” I agree. Sometimes you have to go back a thousand years to find a person whose life inspires you. We thank Nancy Marie Brown for answering our questions.